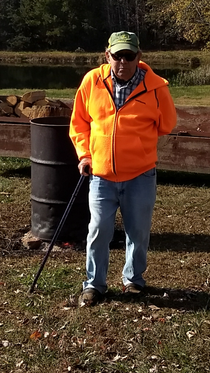 Harley Thomas Hall, 75 of 149 Stoney Creek School Road, died Wednesday morning, April 4, 2018 surrounded by his family at The Hospice Home of Rockingham County. Born in Caswell County son of the late Louis Thomas Hall & the late Novahlee Brinkley Hall. Mr. Hall was an electrician and retired from Adam's Electric Company after many years of service. Surviving are two daughters Robin Hall Winchester (Scott) of Reidsville, Melissa Hall Saul (Clifford) of Reidsville; two sons Daniel Lane Hall of Reidsville, Thomas Lee Hall (Tina) of Reidsville; one sister Annie Lee Ellinington of Oregon Hall; seven brothers Johnny Hall of Leasburg, Louis Hall of Reidsville, Jimmy Hall of Martinsville, Va., Sammy Hall of Reidsville, Tommy Hall of Oregon Hill, Gwynn Hall of Reidsville & Abner Hall; nine grandchildren Andrea, Anthony, Danielle, Brittany, Dustin, Dillion, Daniel, Hannah & Isaac; eight great-grandchildren Emma, Abbygayle, Addison, Lela Mason, Riley, Bianca, Valerie & Ayden. Funeral Services will be held 1:00 PM Friday April 6, 2018 at Harrelson Funeral Services Chapel by Pastor Ricky Cox. Interment will follow in New Hope United Methodist Church Cemetery. The family will receive friends one hour prior to the services (12:00 PM - 1:00 PM ) at the chapel and other times at the home. Pallbearers will be: Anthony - Daniel - Isaac - Jeff - Brandon & Darrell. Harrelson Funeral Services of Yanceyville, NC is privileged to be serving the Hall Family. Jim, We are so sorry to hear about the death of your brother sorry we couldn't come. If there is anything we can do for you and Georgia please give us a call. We love both of u.
Condolences the Hall family. Our thoughts and prayers go out to your whole family. Psalms 147:3 says God, "heals the broken hearted, and binds up their wounds." May God bring you comfort and peace.